React in real time. Digital signage can broadcast the halftime score, post happy hour specials, unveil new album art, share tweets, and disseminate emergency broadcasts when panic paralyzes a region. Displaying MEMA updates during the 2013 Boston Marathon tragedy transformed our Boston colleagues from helpless viewers to helpful residents in a matter of minutes. We resolve to be plugged in, timely and good citizens of our communities. Be contextually relevant. 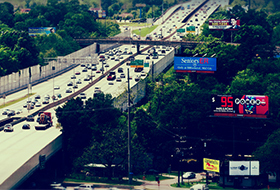 Localization has always been an inherent component in billboards, and this has increased trifold with day-parted messaging, traffic monitors and weather feeds. Target shared weather-triggered billboard messaging with suggested outdoor activities for parents to enjoy with their kids. Chance Of Rain Today. Go Puddling! Sun's Out! Go Sprinklering! We resolve to be relevant. Integrate personalization. Let's be honest, we all like to see our name in lights. We also like to confess our secrets, though it's usually after a cocktail or two. Clorox's "Bleach It Away" campaign in Vegas invited passersby text their most bleachable moments to digital boards. Their confessions were displayed for a few seconds before being magically bleached away (if only life were that easy). We resolve to continue to engage consumers in unique ways. Make it an experience. Transit shelters were once places to huddle, pace and text friends and family while you waited. Today, a consumer can shop for groceries, sample perfume and swim with the fish. Yes, fish. The Monterey Bay Aquarium brought virtual scuba diving to bus shelters in San Francisco and entertained thousands of commuters. Air travel is also about to get interactive. With the recent FAA ruling in October, airline passengers will be able to tune in and turn on their mobile devices in-flight. SmartTray will equip planes with special seat-back trays to hold these gadgets and engage consumers via branded games and videos, giving in-flight entertainment a new dimension. We resolve to make traveling more fun. Increase measurability. As an industry, we need to supercharge our efforts to provide the best metrics possible to support efficient advertising spends. Traditional Out-of-Home advertising company Posterscope and mobile ad network xAd recently partnered to launch a unique program that will enable the digital retargeting of people who have seen billboards or other OOH advertising in the real world. We resolve to test, benchmark and share our analytics to become better integrated with other media. If you ever ponder the power of Out-of-Home, fast forward to a few hours before the stroke of midnight on December 31. Over one million people will congregate in freezing temperatures to watch an iconic, crystalized glowing ball make its descent down a flagpole in the most vibrant, outdoor advertising environment in the world -- Times Square. How's that for engagement?! The original article appeared on HuffingtonPost.com. 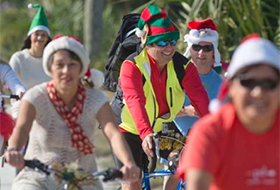 Thomas Muldowney, a Senior Account Executive at Lamar Advertising Company, was one of about 100 locals who participated in this year’s Elf Ride, which raises toys and money for South Walton Fire District’s Angel Tree program to bring Christmas to needy families in the area.